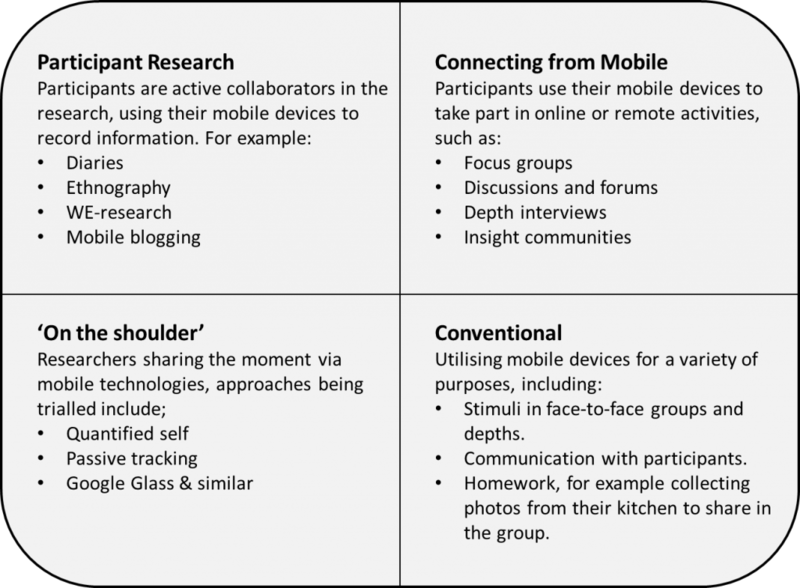 As part of the book on mobile market research that Sue York, Navin Williams and I are writing we need to give an overview of mobile qual, before going into depth. Do you think the image below helps? What about the titles for the segments? By WE-research we mean projects where participants are recruited to capture a variety of qualitative data about their lives. They might be asked to capture images of waste, or videos of travel problems, or audio comments about the school run, for example. The term WE-research was introduced by Mark Earls and John Kearnon a few years ago. But, do you have a better term for this type of research? We are planning on three chapters on qualitative research, indeed we have written three chapters, an overview which covers all four segments above, followed by chapters specifically on the top two segments. Our view on techniques like passive tracking, Google Glass etc is that there is simply not enough material yet to have a chapter on it, there is too little experience around. Perhaps it is included in “Diary” or “Ethnography”, but I would like the word “Shoppers study” in the list of Participant Research. I think this is a very interesting topic and one that I would like to give more thought to. A couple of quick thoughts are about how mobile can be used as part if the feedback loop (giving as well as gathering). This then links to dissemination which in a mobile realm equates to sharing in which there is huge potential. Possibly also analysis, or sharing findings? Location based or GPS tracking of activities or walking routes?